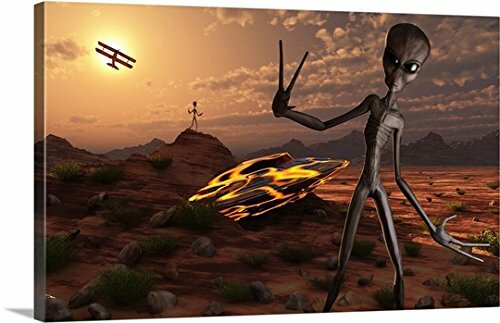 Gallery-Wrapped Canvas entitled 'Grey aliens at the site of their UFO crash'. Grey aliens have been visiting Earth for many years now. The Roswell crash was an incident that received major news coverage when the military admitted to finding a flying saucer. After a lot of disinformation and cover-ups, the crew and ship were taken to Area 51, which has long been a place of ... Multiple sizes available. Primary colors within this image include: Brown, Light Yellow, Black, Light Gray. Made in the USA. Satisfaction guaranteed. Inks used are latex-based and designed to last. Canvas is a 65% polyester, 35% cotton base, with two acrylic latex primer basecoats and a semi-gloss inkjet receptive topcoat. Canvas is designed to prevent fading.